Come on over, got the fire going and coffee a' brewin'. 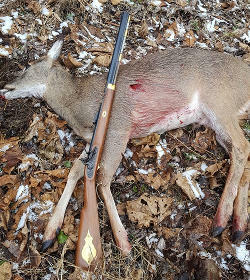 Go carve you out a piece of that hangin' venison I shot yesterday and cook up some good eats while we chat about 18th and 19th century black powder firearms. 18th and 19th centuries only! Share your knowledge, or learn, about all manner of personal and military firearms powered by black powder, designed and built between 1700 and 1900. No talk of any other weaponry, please. 18th and 19th centuries only! Balls, shot and bullets of lead and lead alloy, black and sub powders, gun flints and percussion caps and primers, paper and metal cartridges, all manner of projectile patching and waddng and lubrication ... and the tools and accessories for building loads and cartridges. No white powders. 18th and 19th centuries only! All support gear for the firearms and ammunition of those eras. 18th and 19th centuries firearm designs only! 18th and 19th centuries only! All the support gear for the firearms of the day. Using the firearm designs of the 18th and 19th centuries to harvest game. Matches, rendezvous meets, reenactments, get-togethers, woods walks, etc. - that focus on the firearms of the 18th and 19th centuries. Any and all items that pertain to the firearms, and their accoutrements and peripheral gear that are relevant to the 18th and 19th centuries. Historical information and data pertaining to firearms of the 18th and 19th centuries. Classifieds for 18th and 19th century design firearms and their accoutrements only. Enter transactions solely at your own risk and do obey all city, state and federal laws.